As defined by the Humane Society of the United States, “Puppy mills are breeding facilities that produce purebred puppies in large numbers. The puppies are sold either directly to the public via the Internet, newspaper ads, at the mill itself, or are sold to brokers and pet shops across the country. The documented problems of puppy mills include over breeding, inbreeding, minimal veterinary care, poor quality of food and shelter, lack of socialization with humans, overcrowded cages, and the killing of unwanted animals. To the unwitting consumer, this situation frequently means buying a puppy facing an array of immediate veterinary problems or harboring genetically borne diseases that do not appear until years later. The farming of dogs is an American disgrace. Take a stand against this industry. Do not purchase puppies in pet stores or on the Internet. Do your homework before you purchase a puppy. Better yet, visit your local shelter or rescue group and adopt a dog who already has no place to call home. Take pride in rescuing your dog and ask all of your dog-loving friends to do the same. It is high time to put an end to the pain and suffering forced upon the wonderful creatures that we call “man’s best friends”. How is puppy milling different than reputable breeding? Puppy mills exist for only one purpose – to make money. In a puppy mill, there may be as many as 30 different breeds and up to 800 or more breeding dogs. Every female is pregnant with every heat, including their first heat at 6 – 10 months old when they themselves are still a puppy. The puppies receive little to no medical attention, are not socialized with people, are almost always taken from their mothers too young, and often start their lives out in the world sick and scared. There is absolutely no regard to the health and well-being of the breeding dogs and when they can no longer produce puppies, the majority of them are killed. Most often, a reputable breeder has great interest in one or perhaps two breeds. The purpose of their breeding program is to continually strive to bring their bloodlines closest to the breed standard. A reputable breeder spends a great deal of time, effort and money showing their dogs, socializing their dogs, having their breeding dogs tested for genetic defects, and being very careful to place their puppies in permanent, loving homes. A reputable breeder will at any time for any reason, take any of the puppies they’ve bred back into their care for the lifetime of the dog, taking full responsibility for the dogs that they have produced. A reputable breeder wants to know about you and develop a relationship with you. They enjoy updates and photographs of their puppies as they grow and are always available to help with any questions or concerns about their puppies. One of the most important things to know is that a reputable breeder has nothing to hide. They want you to meet the parents of the puppies and see the environment the puppies are raised in. We believe there are many reputable breeders out there, doing a fine job of raising healthy and sound puppies. Buyers must do their homework – contact the National Breed Clubs and find out who the reputable breeders are. Visit the breeder, meet the parents of the puppies, inspect the environment the puppies were raised in, ask lots of questions and if it feels like they’re hiding something, they probably are and you’d be best served to move on. Why shouldn’t I just go to the pet store and buy a dog? 99% of these puppies come from puppy mills. When you purchase a puppy in this way, you are directly supporting a puppy mill and contributing to the pain and suffering of the parent dogs. Pet store employees will tell you that they only deal with “USDA licensed” kennels and the puppies have AKC papers. Unfortunately, these are the two organizations that give people the serious misconception that these puppies come from reputable kennels. The only thing that AKC papers mean is that the puppy and its ancestors are purebred. AKC papers mean absolutely nothing about the health and temperament of the puppy and nothing about the quality of the breeding establishment the puppy came from. Why do the mills turn dogs over to rescue? First of all, it is important to understand that our rescue contacts have worked with these breeders over time to help them understand that there are “retirement homes” available for these dogs. Our contacts do not present themselves as “rescuers”. It’s a very subtle and non-threatening relationship that is developed. Some think the mills that turn dogs over are perhaps those with a bit of heart left for the dogs. Others think it’s just fewer dogs they have to worry about executing. Whatever the reason, this is the only chance these dogs have at getting to know life outside of the cold, dark confines of their wire cages.Dogs are released for a variety of reasons. The most common reason is that the female dogs at 5-7 years old are “used up” for breeding purposes. 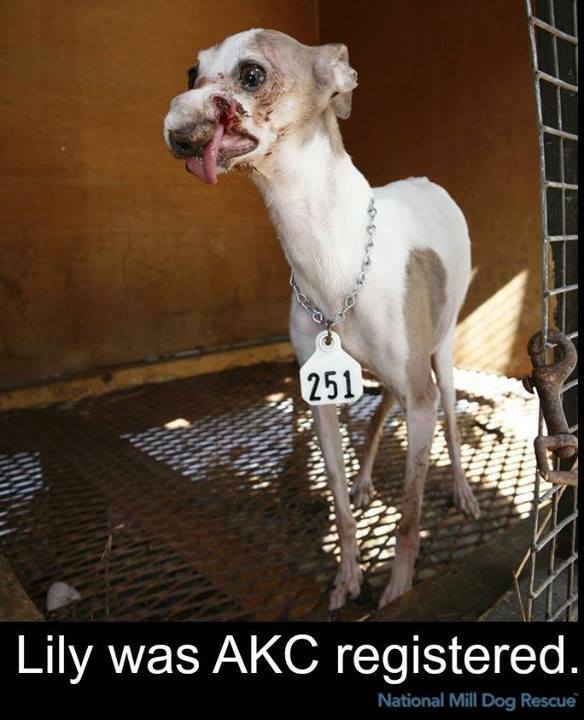 Their bodies simply can no longer produce puppies and many of these gals are very, very sick upon rescue. I am quite certain that on a daily basis in the mills, many an older female dog is found dead in the cage – unable to fight off the diseases and ailments that years of producing puppies had caused for them.We also see young dogs and puppies. The young female dogs are usually not good at mothering. Most mill dogs are bred on their first heat and some, still being puppies themselves, are unaware of what to do when they give birth and will eat their puppies. If they do this a second time, they are released. We see many young male dogs as it only takes one good breeding male to impregnate many females, so many of the young males are turned over because they are not needed. Finally, we see puppies that are not accepted by the brokers for several reasons: they may have enough of that certain breed in their trucks, the puppies may have gotten too old (10-12 weeks) to sell to the pet stores or the puppies may have health issues. If the puppies are not released to rescue, they are held back for breeding or killed.How can I adopt a Puppy Mill rescue? National Mill Dog Rescue has saved over 8,000 discarded breeding dogs from puppy mills across the United States. All of these dogs are brought back to their headquarters in Peyton, Colorado where they receive any necessary medical care, lots of love, and a safe place to stay until they are adopted. If you are interested in adopting one of NMDR’s rescues, please click here for all the details. Information and image courtesy of National Mill Dog Rescue.